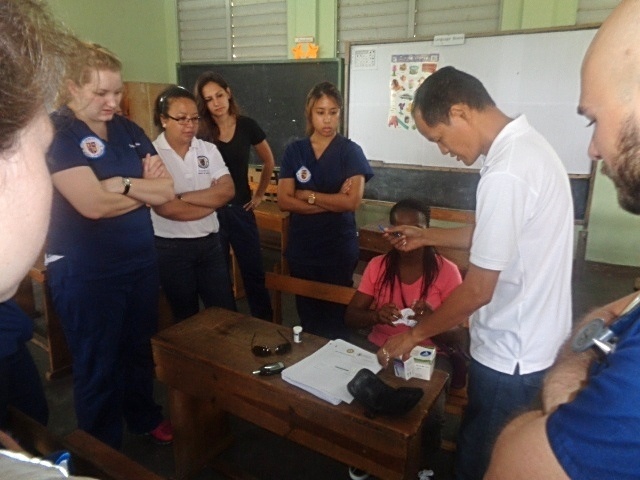 Trinity School of Medicine students have assisted the Rotary Club of St. Vincent in its Village Doctor exercises around the islands for over five years. 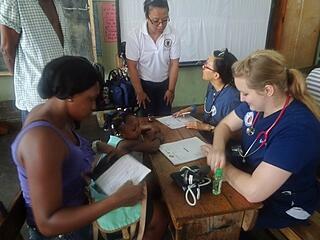 The Village Doctor exercise is the flagship program of the Rotary, and it sees a number of healthcare specialists and volunteers traveling to areas within St. Vincent and the Grenadines that are medically under served, conducting clinics and providing medication. Last Sunday, eleven fifth term Trinity students and three faculty members joined the entourage that traveled to Richland Park, a community in St. Vincent's interior. Upon arrival, the students assembled at the Richland Park Government School, assisted in clinic setup, and prepared for their role throughout the day: assisting in triage. Trinity's own Dr. Ibrahim quizzed each student on their duties and walked them through the procedures as a final check before focusing on his own obligations for the day as a visiting clinician. Emma's colleague Francis Audsio concurred, “I learned a great deal about working with a couple of different patient populations I’m not normally exposed to,” he said, “It’s always a challenge to deal with different kinds of interactions and navigating any communication barriers, ultimately being able to figure out what they're here for.” Audsio went on to explain that he had found that a lot of patients had come in without knowing exactly how to describe the condition they were experiencing, so it took a lot of working with the patients to come to a common ground in communication. “We’re going to have to be able to do that no matter where we go,” he added. After going through triage, patients were sent to the appropriate specialists, including general medicine, a gynecology, ENT, pediatrics, ophthalmology, and a dentist. 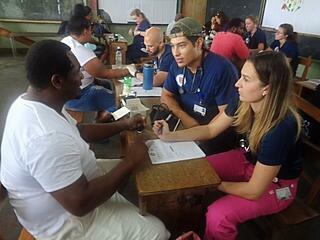 As triage wrapped up, the Trinity students moved on to "active shadowing" of these specialists. This involved watching, but also asking questions and assisting where possible or appropriate. This went as far as the physicians asking the Trinity students questions, giving them the opportunity to learn the diagnostic experience. Dr. Ibrahim applauded the Rotary for continuing to invite Trinity to assist, “The collaboration with the Rotary has been very fruitful for Trinity. It’s a very good way of exposing students to clinical cases that they’re learning about in school.” Dr. Ibrahim was also happy that the school was continuing to reinforce its philanthropic culture. “Another thing that is quite rewarding is to give back to the community that has helped the students to grow as they stay on the island." President of the Rotary Club of St. Vincent and the Grenadines, Mr. Joel Toney, agreed. “Trinity School of Medicine has been collaborating with us for more than five years and we have a great relationship. The students are held to a very high standard of work."